You can tell a lot about a person by judging the contents of their bag, and although i've changed my daily handbag over the years, the contents have pretty much stayed more or less the same. I have to admit this post is a little cheeky as in real life, I actually carry two bags, this one with my general stuff and another one with my laptop and uni stuff but maybe that's another post for another time..
1. The Handbag: My bag of choice lately has been the Marc B 'Staten' very kindly sent to me by the lovely folk at BANK. 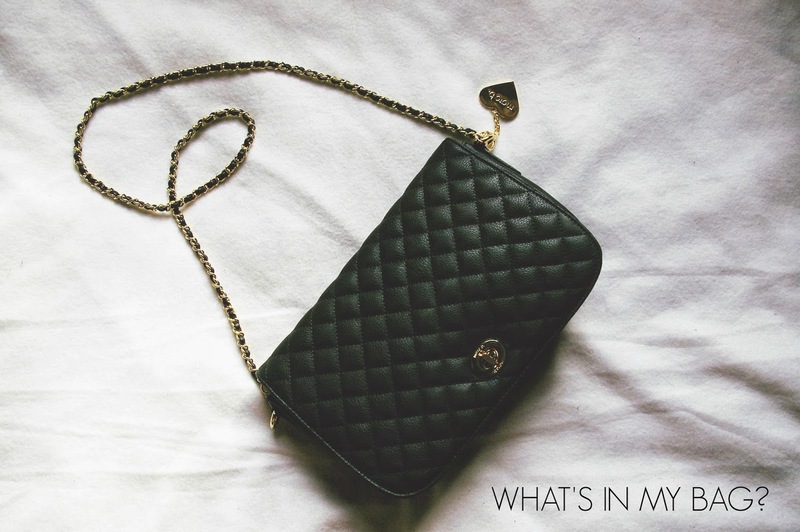 It reminds me of the Chanel quilted cross body bags. Very classic, surprisingly spacious and easy to wear with just about anything. 2. My Diary: You might remember this post from the New Year, where I said I wanted to be more organised this year. It's working! 3. Glasses: So I can read, they're from here if you were wondering. 4. Body Mist: Soap & Glory hands down have the best smelling products in the world. I've been using their body mists continuously because they last long and smell so darn good. 6. Lip balm: Ashy lips are never ever cute. 7. An Emery Board: My nails are naturally very long and often get snagged on things, to prevent breakage I carry and emery board with my to file down the parts of my nail that snags. Nothing irritates me more than breaking one nail and having to chop the rest off! 8. Hand Cream: Because Ashy hands are also never ever cute. 9. Earphones: I feel very out of sorts if i don't have some Schoolboy Q or Childish Gambino in my ears when i'm out and about. 10. My Phone: My lifeline essentially. My phone cover of choice has been Skinnydip London's 'Emerald Case' which you might remember from this post! 11. A Mirror: To check for dry lips and eyelashes lodged in eyes. 12. 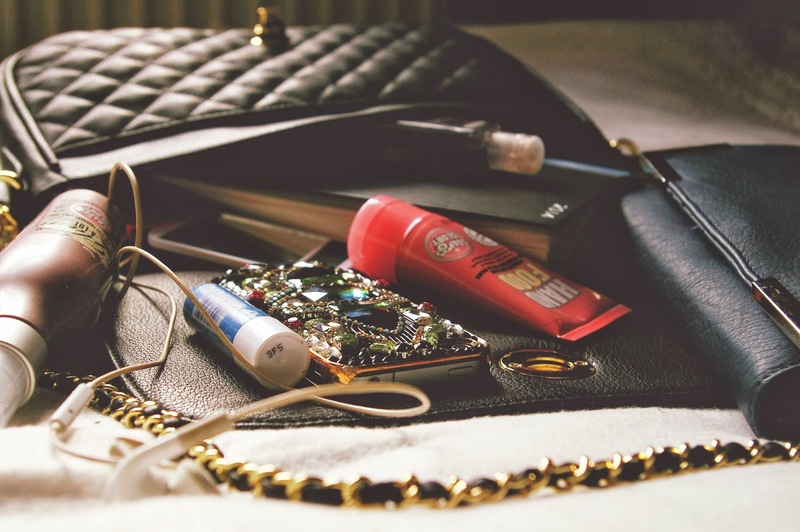 My Purse: It has just about everything in there. I bought it in the Warehouse sale for a tenner and haven't looked back since. 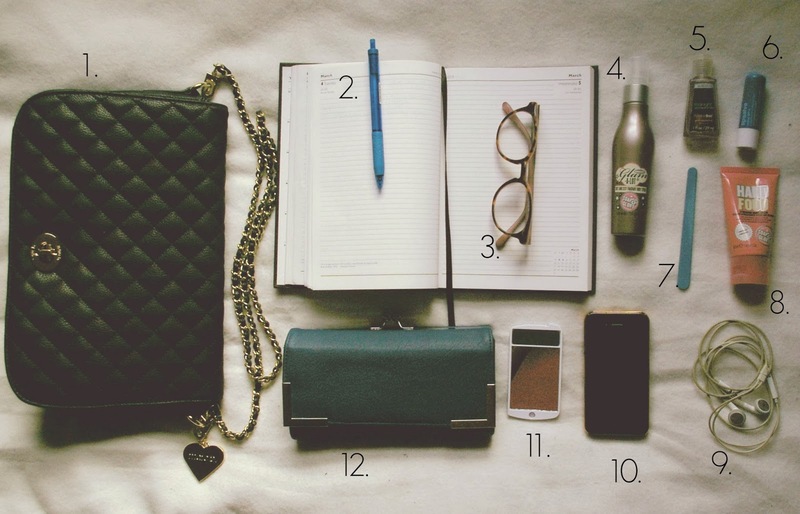 So, what's in your handbag? Link me to any posts you've done down below! That is a gorgeous bag - and a gorgeous purse too.